What the candidates said when questioned on the proposed use of Public Open Space for Commercial Development! 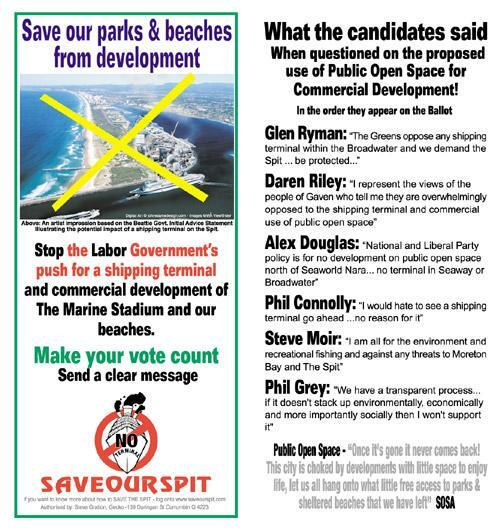 Glen Ryman: "The Greens oppose any shipping terminal within the Broadwater and we demand the Spit ... be protected..."
Daren Riley: "I represent the views of the people of Gaven who tell me they are overwhelmingly opposed to the shipping terminal and commercial use of public open space"
Alex Douglas: "National and Liberal Party policy is for no development on public open space north of Seaworld Nara... no terminal in Seaway or Broadwater"
Phil Connolly: "I would hate to see a shipping terminal go ahead ...no reason for it"
Steve Moir: "I am all for the environment and recreational fishing and against any threats to Moreton Bay and The Spit"
Phil Grey: "We have a transparent process... if it doesn't stack up environmentally, economically and more importantly socially then I won't support it"
Public Open Space - "Once it's gone it never comes back! Click on the image to view the SOSA Gaven By-Election leaflet Front and Back.